Sharing A Link - Jill Ruth & Co.
My daughter found this last night on one of her favorite blogs. I just really wanted to pass this incredible sweetness from Posie Gets Cozy on. It would look so sweet the our gals playroom, but honestly it's such a hodgepodge in there I believe all the work that would go into this would just be lost. 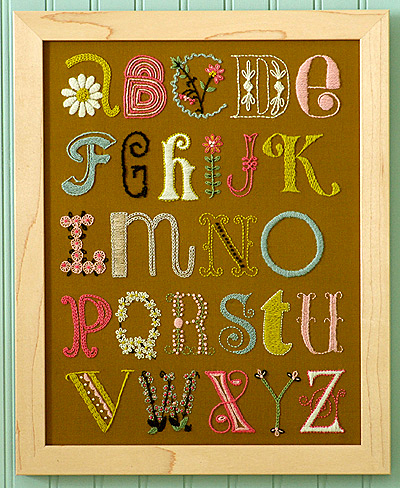 Makes me want to find some vintage looking text and embroider something for my sewing room. Just so inspiring I think! Find the blog post and how to preorder the kit here. She also has a free pattern to embroider Queen Anne's Lace here...ooohh, that would look quite nice on a piece of vintage fabric! Hope you're having a great weekend! My sick kids are on the mend, the wedding centerpieces are almost done, and the wind died down, so it's looking brighter around here this morning! mmmm, yes, posie...a favorite of mine as well. love those letters! this is gorgeous...! lots of work in that one...i would love it in an old frame that's been painted white too!